Hoop Nut #UAAP79 Adamson Ateneo UAAP UP UST #UAAP79 Roundup: Falcons claw Eagles while Tigers maul Maroons on Day 6! #UAAP79 Roundup: Falcons claw Eagles while Tigers maul Maroons on Day 6! Day 6 of #UAAP79 saw Ateneo lose to Adamson thanks to a game-winning jumper from Dawn Ochea, while UST kept UP winless, 83-77. The UST Growling Tigers needed to put down a late rally from the gutsy UP Fighting Maroons as they clinched a 83-77 victory in UAAP Season 79 men’s basketball action on Saturday at the SMART-Araneta Coliseum. UST veteran Louie Vigil led the way with 18 points, six rebounds and seven assists for the Growling Tigers (2-2), which improved to .500 after the win. 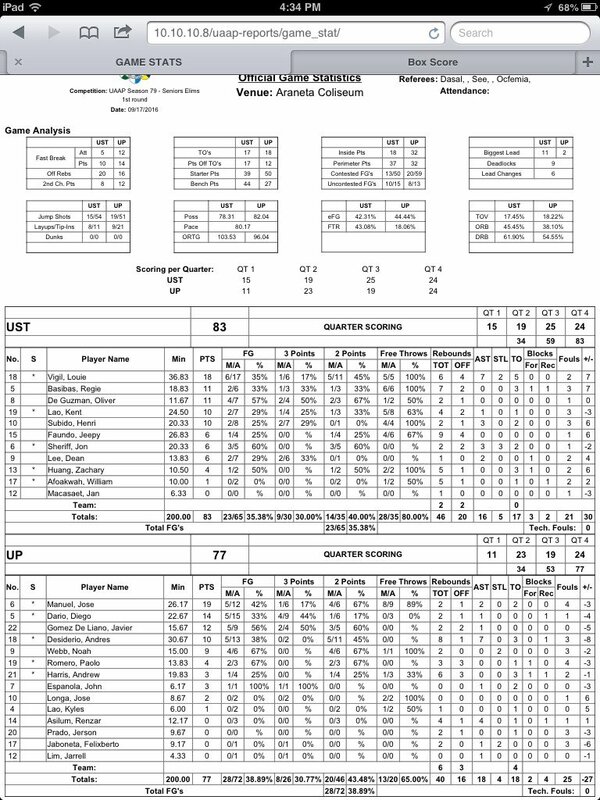 Regie Boy Basibas and Oliver De Guzman each scored 11 points while Renzo Subido and Kent Lao both added 10 markers for the UST cause. UP, which scored 10 unanswered points to tie the game in the fourth quarter, crashed to a third straight defeat after falling short in this one. The win marked the 19th consecutive by UST over UP, the longest active streak between two schools in the UAAP. 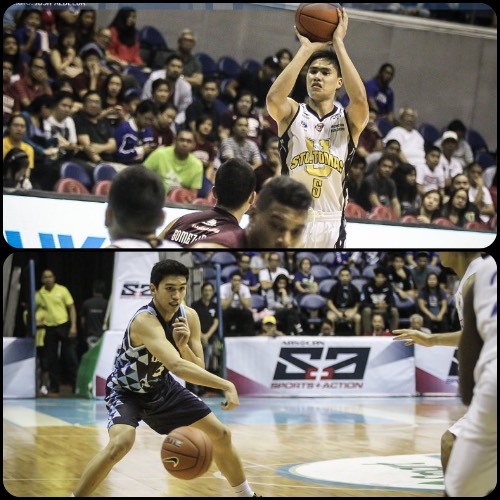 Louie Vigil (UST) - 18pts, 6rebs, 7asts, 2stls. Paul Desiderio (UP) - 10pts, 8rebs, 7asts. The Adamson Falcons stunned the Ateneo Blue Eagles, 62-61, grabbing the victory on a game-winning shot by Dawn Ochea with 1.9 seconds left in a UAAP Season 79 thriller on Saturday at the SMART-Araneta Coliseum. Adamson found plenty of heroes to step up in the win, their second in three games. Robbie Manalang scored 10 of his game-high 15 points in the fourth quarter while Dawn Ochea entered in the last seconds to score his only points on a turnaround jumper off an inbound pass that pushed his Adamson team in front with time running out. 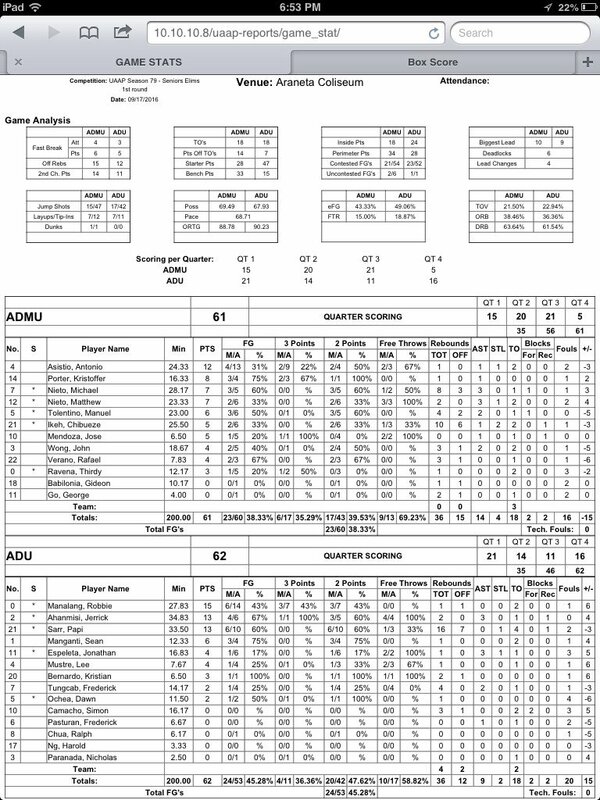 Jerrick Ahanmisi and Papi Sarr also played key roles, scoring 13 markers apiece. Ateneo dropped to 2-2 after a heart-breaker of a loss. Papi Sarr (ADU) - 13pts, 16rebs, 1stl, 6/10 FGs. Mike Nieto (ADMU) - 7pts, 8rebs, 3asts, 1blk, 3/5 FGs.